HARMONY, PA — Join Pittsburgh Steelers QB Ben Roethlisberger at the Giant Eagle Ben Roethlisberger Football ProCamp. The ProCamp takes place on Saturday and Sunday June 13th-June 14th, at Seneca Valley High School located at 128 Seneca School Rd.in Harmony, PA. for Boys & Girls, Grades 1 to 8. Source: Procamps. Throughout the camp Ben will offer tips and instruction, highlighting the finer points of football. Participants will experience various stations specializing in fundamental football skills and will participate in touch football games. Participants will be placed in small groups according to age to ensure each child gets maximum instruction. 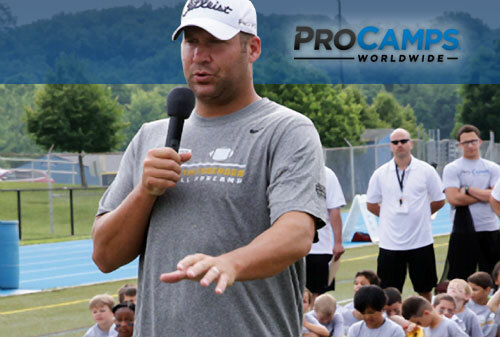 Watch Ben Roethlisberger speaking with Pittsburgh’s CW Network at Seneca High School’s Procamp in August 2013 where he talked about why he thinks youth football camps are so important. Ben Roethlisberger has been the quarterback of the Pittsburgh Steelers since 2004 and has led the Steelers to two Super Bowl championships. He grew up idolizing John Elway, and has often been compared to him and wears number 7 in Elway’s honor. Roethlisberger is also a popular motivational speaker.